There are lots of Lensball mistakes you can make with your photography. In today’s article you’ll discover the seven most common mistakes people make. Once you know the mistake you can make, you’ll learn how to quickly fix those mistakes. 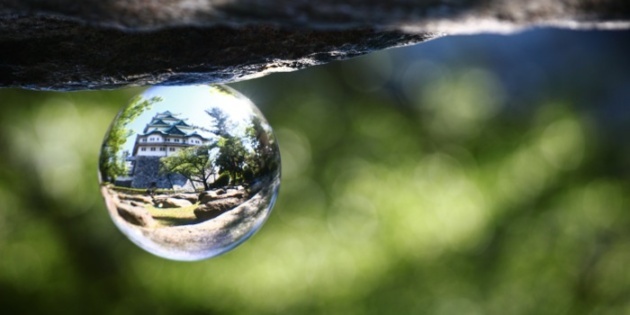 Read on to find out how you can take the best Lensball photos! 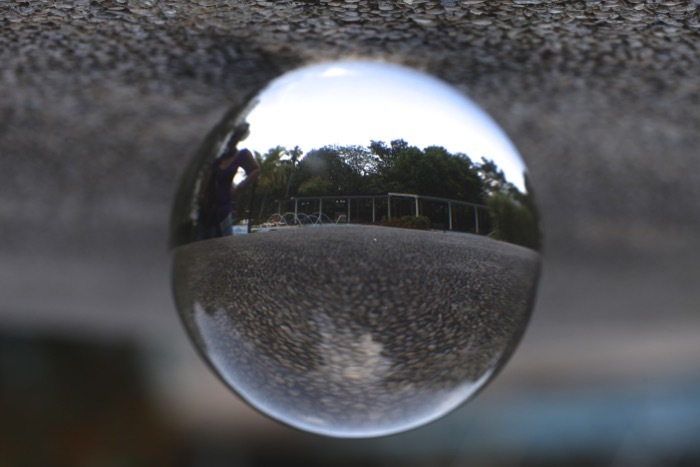 A key element of your Lensball photograph is the background. Getting the background wrong is one of the most common Lensball mistakes. It usually results in unattractive background shapes. It can also lead to the image in the ball needing to be upside down, and that’s not always something you’ll want to do. The busy background occurs for the following reasons. A wide angle lens – The wider the focal length, the more prominent the background of your photo will be. A great way to eliminate this problem is using a longer focal length. This will compress the background, and make the ball itself more of a focus for the image. A small aperture – Using a lens with a small largest aperture, such as a kit lens makes Lensball photography more difficult. You’ll no longer have the choice of just blurring out the background through shallow depth of field. Consider using different lenses like a macro lens, or a prime lens with a larger aperture. Bad background – Bad backgrounds are those that are too busy, and are obviously upside down in relation to the image in the ball. Look for backgrounds that have textures, and leading lines that lead to an infinity point. Not changing the angle – A little change in angle and perspective can make a dramatic difference to many photos. This is certainly the case with lensball photography. At wider focal lengths lining up background lines will improve your photo. At longer focal lengths you can maintain the image in the ball, while choosing a portion of the background that’s not too busy with small changes to the angle you take the photo from. Changing the angle in this photo gives a much nice background. From the left the background is a little bland. Changing the angle brings the bokeh light from the tree into frame. There are images where the ball itself is the main subject, with the background supporting this. It’s often the case that you need an interesting subject within the lensball as well, this is where good lensball scouting comes in. There are several factors that can lead to your subject not being interesting in the ball. The subject is too far away – When the supposed main subject is too far away, it will be difficult to tell this was in fact the object you intended to photograph. If you need a focal length much more than 50mm with a regular photo, to make this subject stand out in the frame, it’s likely too small for Lensball photography. The subject is too small – You can be close to your main subject, but if it’s small it won’t dominate the image inside the ball. Rather it will disappear into the centre somewhere and won’t obviously be the main subject. Look for a large main subject, photographed at a long focal length with the camera angle not aiming directly at the main subject. There is no subject – As discussed earlier, sometimes the ball itself is the main subject. However there are occasions you won’t include a main subject, because you’re working more with the background. Nevertheless your photo will be stronger if you include a subject in the ball, such as a person. You can use layer masking in Photoshop to maintain that clean background, while also including a subject inside the ball. 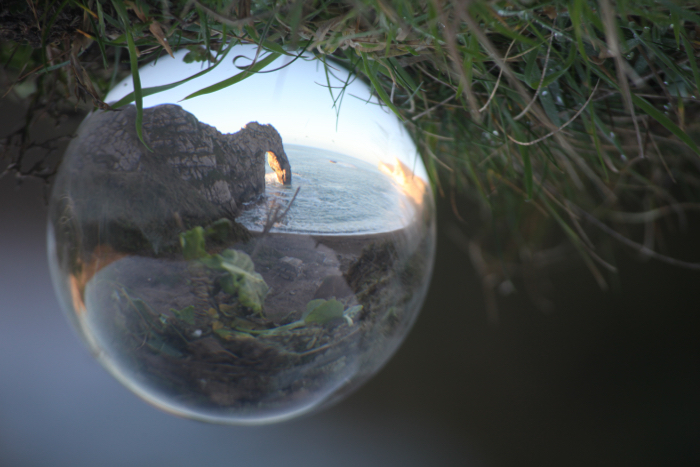 Learn more about doing this through the globalise crystal ball photography course. This image has some nice foreground elements, which look natural in the frame. It could be improved with a clearer main subject within the ball. 3 – The lensball is badly composed. Rules of composition apply to Lensball photos just as much as they do to any other type of photo. Doubly so for lensball photos, because you need to compose the image within the ball, and image outside the ball. So what can go wrong with composition? The ball is a dominant part of the frame, if it’s not composed well this can lead to some jarring negative space. Compositions that work well tend to be a centred symmetrical composition, one that uses the rule of thirds to place the ball off centre, or with an interesting background a more minimalist composition. You may even choose to use a macro lens and cut the ball mid frame, the curve of the ball makes a great line to put on the left of right third of the frame. The typical mistake here is placing the ball on the ground, and letting the ground dominate half of the composition within the ball. This adds little to the photo, unless the ground happens to hold some interest. In addition to this it cuts into the area within the ball, which will hopefully show your main subject. Look to avoid this by getting low to the ground, and photographing at an upwards angle if you can. Even better place the ball on an elevated surface, roughly at the same level as your main subject. There are many mistake with this image. Half of the ball is taken up with the street, meaning it’s been poorly composed. The light coming through the ball is weak, and the trees are badly lit. You can also see too much reflection on the bottom portion of the ball. Bad foreground elements are among the worst Lensball mistakes you can make. It can have a detrimental effect on the rest of the photo, making the difference between a great and a bad photo. This could be anything from including a tripod head in your photo, to placing the Lensball on an unattractive wall. Sure both methods elevated the ball, but at a cost that’s not worth paying. Remember that photography is the art of subtraction, so how do you remove bad elements? Remove the tripod – You can remove the tripod by using post processing, learn more about how to do this by purchasing Globalise. Use your hand – You can use your hand to hold the Lensball in many different ways, or if you’re lucky you can get a volunteer to hold the Lensball for you! Use more interesting surfaces – There are plenty of great surfaces to rest the ball on. Some of the best are natural surfaces like a rocky outcrop, or a tree branch. Explore your area looking for better places to put the ball than a flat wall. Avoid the holder – Yes the holder is a simple way of keeping the ball in position, but is often not that attractive within the frame. It becomes an even greater issue if you want to flip the image upside down. Instead look for divots on a surface where the ball is steady. Although it’s more secure, the Lensball on the holder doesn’t usually work well as a photo. In this case the wall had plenty of divots, and the ball could have been places on one of those instead. There are cases where reflection on the surface of the ball can add interest. 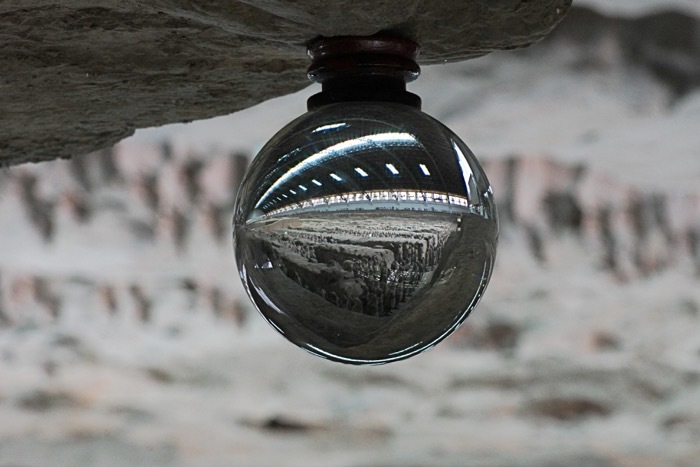 In the majority of instances those reflections are undesirable though, and distract the viewers interest from the main subject within the Lensball. So one of the easiest Lensball mistakes you can make is reflection on the glass surface. There are two main types of reflection, both caused by strong light that’s behind you. The sun – With the sun behind you, you’ll often get a very strong point of light on the balls surface. This is the suns reflection, and if you’re unlucky this sunlight can cover your main subject within the ball. Look to avoid this by photographing from the shade where possible. You may also be able to block the sun, by holding your hand in the way, or asking a friend to do this. Objects behind you – When the image inside the ball is poorly lit, and or the objects behind you are well lit you’ll get reflection on the lensballs surface. Locations like tree canopies can cause this, or perhaps a window that’s behind you. A strongly lit main subject will negate much of the reflection, so concentrate on ensuring the main subject is lit. On the left you can see sunlight reflection, which cuts across the woman’s face. A change of angle and moving into the shade can minimize this reflection. Good light is key to photography, so it’s no surprise that bad light is one of the Lensball mistakes you can make. This usually happens when the composition is there, the main subject is there, but the light is in the wrong position. This is a really simple problem to fix, as it just requires better planning. Sun direction – Look to make sure you arrive at the time of day when the sun will be lighting up your subject. The website suncalc will help a lot with this. North facing – Is your subject north facing? That’s a little trickier, but if you photograph at the height of summer, you have a chance even this will be lit by the sun. Evening – In the evening buildings are sometimes lit. This can be used to great effect with the Lensball, as this light is almost always good. Failing this you could consider light painting your object, or using strobes to light it up. This photo of Durdle Door in the UK has not been well lit. The composition works, but the photo needed to be taken later in the day, when the sun direction is different. You can also see excessive reflection on the ball, a problem that would not be there had the main subject been well lit. It’s not always easy to find a good location to put the Lensball. 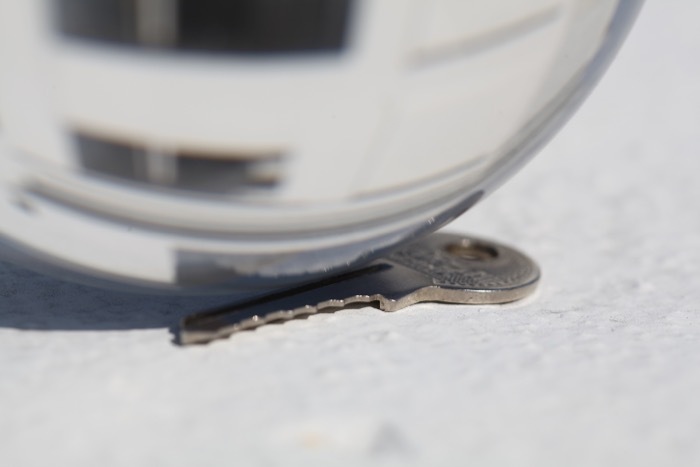 It’s a key consideration that leads to Lensball mistakes. Bad position can lead to a number of the Lenball mistakes already discussed such as bad foreground elements. So what kind of mistakes can be made? On the ground – Placing the ball on the ground is an easy option. It’s often not the best though. Look to elevate the ball by taking it handheld, or placing it on the wall. Fire risk – Placing the ball in a place where there is dry grass on a hot sunny day is a potential fire risk. Even storing the ball at home needs care, as sunlight coming through the window can cause a fire. Always be aware of where the sun is in relation to the ball, and remember the sun moves throughout the day. Against the light – Look to avoid photographing into the light. Exceptions might include sunsets, or when you wish to photograph a silhouette. However in most cases it’s best to photograph with the sun behind you. Too far from the subject – Getting close enough to your main subject, so they’re prominent in your photo is an important thing to do. Remember if the main subject doesn’t fill the frame of a wide angle lens, it’s probably not going to work for a Lensball photograph. A non flat surface -It goes without saying that a ball will roll off a surface that’s not flat. Putting the ball on a surface like this is one of the Lensball mistakes that can end up damaging the ball. The location might be great for other elements like the main subject, or background elements though. In this case look for any natural divots. Failing this use objects like pebbles behind the ball to block the ball from rolling away. Placing objects behind the Lensball to prevent it rolling away is sometimes needed on a non-flat surface with no divots. What Lensball mistakes have you made? There are many Lensball mistakes that can be made. In this article you’ve learned the important ones, and will hopefully have come away with solutions to those problems. 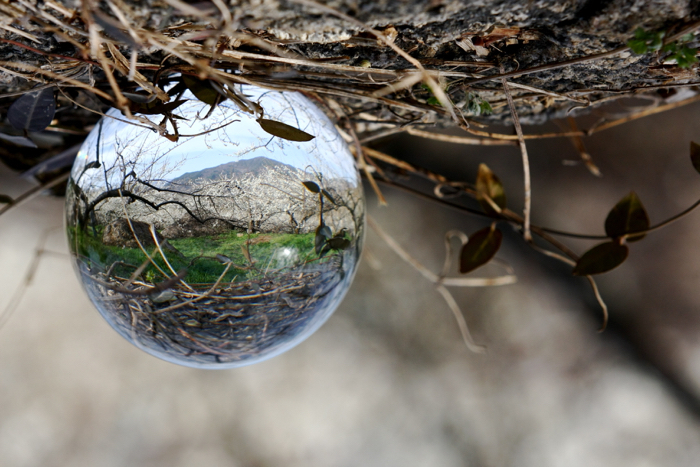 Have you ever made mistakes with your lensball photography? What mistakes were they, and how did you fix them? As we all know, mistakes are part of the creative process so don’t be afraid to share them in the comments section.